The dhb Flashlight socks are the smallest and cheapest items in the company's commuting range, but still offer good quality and comfort as well as neat reflective touches. If you’ve decided that high-vis is en vogue this season, then these new dhb Flashlight socks are most definitely for you. Luminous yellow with nice reflective touches, they will add a bit of colour to your outfit during the day and make sure that you’re seen after dark, although their breathability means they’re best saved till spring. 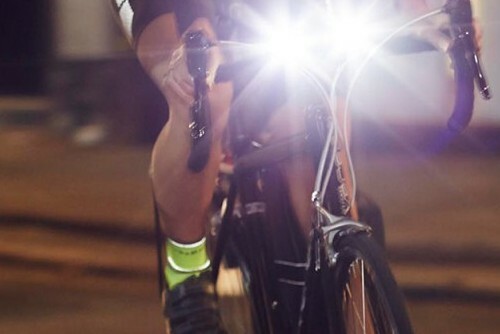 Literally the most eye-catching feature of the dhb Flashlight socks is their colour. Luminous yellow might not be to everyone’s taste, but with the likes of the SealSkinz Ultra Grip Hi Vis Gloves brightening up the roads, it’s certainly here to stay. Setting these socks apart from other high-vis offerings from the brands such as DeFeet are the two 3M Scotchlite reflective bands which sit around the top and bottom of the cuff. Almost unnoticeable in daylight, once they sun goes down they turn into a rotating glimmer of light that should catch the eye of inattentive drivers. The dhb Flashlight socks have a multipanel contruction which allows for a reinforced heel that proved comfortable and didn’t show any sign of wear and tear over the period of our testing. The stitching around the toe was also of good quality with no portruding loose threads to tickle your toes and steadily drive you up the wall on longer rides. The upper is formed of a dense mesh which extends from the toe to the bottom of the cuff, providing excellent breatability. However the dhb Flashlight socks are essentially designed for the morning and evening commute, meaning good breathability can equal slightly chilly feet for much of the year. If you’re after high-vis socks then these are some of the cheapest on the market at an RRP of £7.99, and dhb have done a good job of packing a pretty simple garment with plenty of neat features rather than just taking a standard sock and turning the lurid up to 11. We’ll leave it up to you to decide where the dhb Flashlight socks will fit into your wardrobe. Assuming you like the colour, the dhb Flashlight socks are a good option for commuters looking to make sure they're seen on the roads. The socks are both comfortable and durable, although you might want a warmer pair for chilly mornings and evenings.